Each cabin has a PC (Windows 10 operating system) with software programs for creating and editing audiovisual content. 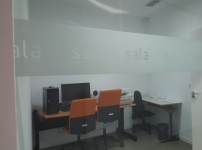 The use of these rooms implies the knowledge of the computer applications by the users and users thereof. Some program has tutorials, such as Cyberviewx, but not the rest. Audition and digitization of vinyl records and cassettes (booth 1). Viewing and digitizing VHS tapes (booth 2). Viewing and scanning slides or negatives (booth 1). Viewing and digitizing mini DV tapes (booth 2). Scanning of printed material up to A3 size (booth 2). Sound recording (booths 1 and 2). From Monday to Friday from 9:00 a.m. to 9:00 p.m. They will be closed on weekends, holidays and vacation periods. Audacity. There are high quality voice recording equipment in rooms 1 and 2. Canon DR 7090c (cabin 2).Documentary scanner. Cyberviewx (cabin 1). Slide and negative 35mm scanner. Its use must respond, exclusively, to the realization of activities of creation and edition of audiovisual contents. The user will be the one who will make their own materials autonomously. These rooms are for the exclusive use of the installed equipment. The user must record their work on their own portable device. The Library will not be responsible for the damages or loss of data in the files of the user staff. The user is solely responsible for the state of the files with which he comes to work in the rooms. To use the work rooms in groups it is necessary to belong to the university community of the UA and make the corresponding reservation. The holders of the reservation must personally show their University Identification Card (TIU) at the information desk. Failure to appear in the Chamber during the first 15 minutes will result in the loss of the reservation. The responsibility of the Room falls on the persons who have made the reservation. If, before occupying a room, there is any malfunction, they must notify it at the information desk. This service is subject to the general conduct guidelines in the Library: no smoking, no eating, no drinking, respecting furniture and computer equipment. The misuse of this service will suppose the suspension of the use of the services of the library. If the users are absent from the room at some time, they will remain responsible for the belongings they have left in it. The Library staff will not guard any object owned by the user staff.